Need some new kitchen knives? Check out this deal you can snag on Amazon. You can get this 15 Piece Knife Set! This would make a nice gift for someone starting out too. 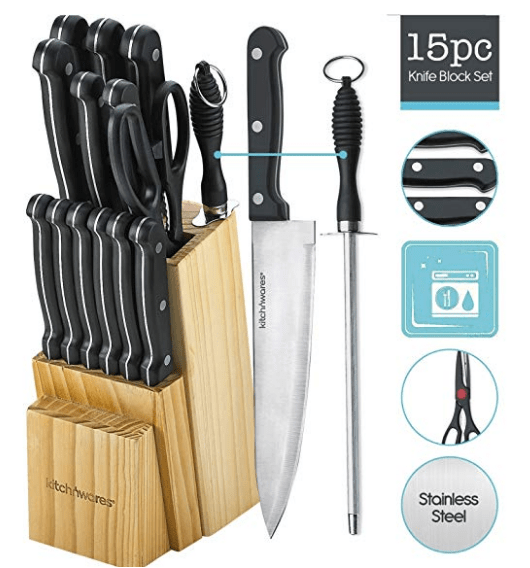 VALUE SET – 15-Piece Set Includes Multiple Models Of The Items: 8″ Chef Knife, 8″ Bread Knife, 8″ Carving Knife, 5″ Utility Knife, 3.5″ Paring Knife, 5″ Steak Knife (6 Pieces Each Having 1.5 Mm Thickness), 6” Boning Knife, And 12” Sharpener. Also Includes Pair Of Kitchen Scissors And Butcher Block For Convenient Storing Of The Knives. Conservative Blade Thickness And Elite Design Allow For Easy Handheld Use. BLADES MATERIAL – Knife Set Blades Are Made From 420 Grade 3Cr14 Stainless Steel. The Following Formula Is A Breakdown In The Steel: Around 13% Chromium And 3% Carbon. It Has A HRC Of 52-55 Making Blades Relatively Soft. Tarnish-Resistant, Rust-Resistant, And Easy To Clean Stainless Steel Blades. Scissors Blade Are Made From 420 Grade Stainless Steel. WORLD CLASS KNIFE SET – This Global Knife Set Is Restaurant And Culinary School Knife Set Quality. It Is Very Resistant To Moisture, And It Has Good Resistance Over A Wide Range Of Bases And Acids Meaning It Will Last Longer. It Possesses Good Fatigue Resistance. It Has Good Impact Strength. It Has A Good Resistance To Electricity And Is Thus A Good Electrical Insulator. EASY CARE – All Knives Store Safely In The Rubberwood Knife Block. (Please Hand Clean And Don’t Use Dish Washer) This Knife Set With A Block Is An Essential For Both Professional And Amateur Cooks. It Sets You Apart. Sign up for Amazon Mom to get FREE 2 day shipping, 20% off diapers & wipes, and more!